As you can see, I have made six hats in seven days. 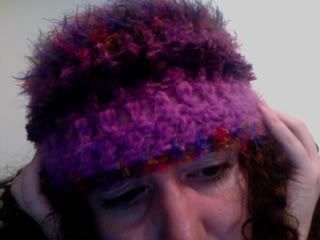 I am very proud of my hats, although I'm not entirely sure what to do with them, since I don't actually wear hats (they mess up my hair!). A couple of them will probably be given away. I am also thinking about selling them, although there is no way on earth to sell them for the amount of money they cost to make. If anyone would actually like to buy one, or would think about buying one, let me know how much you would be willing to pay for a hat like these. I might keep the white-and-pastel one for myself. The Tuesday hat is probably going to get tiger ears added to it at some point. 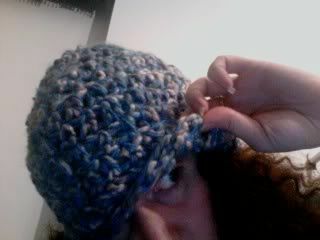 I already have a hat lined up for tomorrow that is going to be someone's Christmas gift! In that spirit, I would also like to post my Christmas wish list up. As usual, it includes stuff I doubt any of you will get me that is really just what I want from my parents, but also stuff that people can totally mail me or send me online. 6) Yarn. Any kind, although the weirder the better. 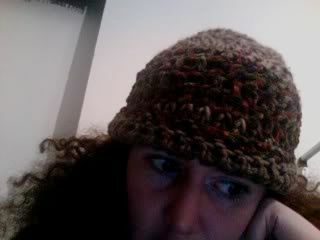 If you send me yarn, I will make you something, although not necessarily with the yarn you send me. 7) Art supplies/sketchbooks. Likewise, anyone who sends me art supplies will get a picture of some kind. If anyone wants to mail me anything, let me know and I'll give you my address. I'm going to put up a call for greeting card addresses in the next couple days. 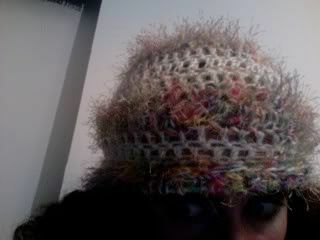 It's a pity the hat messes up your hair as you look good in all of them. You're your own little Vogue spread! Aw, thanks! I love making them; I made another one today. Yay hats, they all look great!! Cute hats! I agree with kamenkyote; it's too bad, because you do look good in all of them! One of them has your name on it! Message me your address and let me know if there's one you like especially. My address is in this post. You're great! Ok! Thursday is the one I made with you in mind, so if you hate that one, let me know, otherwise, I will mail it out to you sometime before Christmas! I am mailing out your jewelry on Friday (payday). I have yarn envy. Every time I see something with a fun yarn, I'm like "WANT TO KNIT." I am the same way! I just spent like an hour organizing my yarns! Those are very pretty hats. You have my approval as a fellow hat-maker. I was waiting for your approval. As the genius behind Richard Hartley. very lovely hats. go on you. and they do totally look great on you. I don't know how to knit yet! 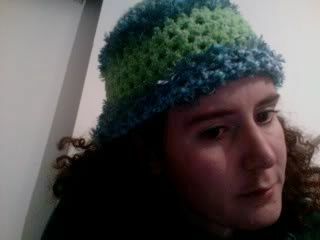 I crochet! 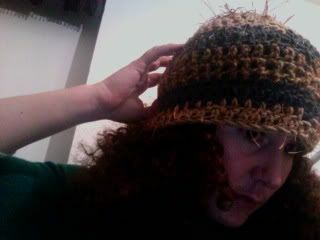 It is super easy, and hats take 2-4 hours, most of the time. Some of the more complicated ones or the ones with tiny stitches take longer, but I can get a hat done while watching tv and roleplaying in the evening! I should think about posting a wish list, but ? I'm in americorps, and I don't have a lot of cash, AND I pretty much hate christmas. somehow a whole knitting world of "things you can actually MAKE while watching TV or doing something else you like" just opened up for me. Someone else on my flist asked for music and recipes too, so I'm going to give you the same links I gave her. Recipes: http://dominica.malcolm.id.au/?cat=28 -> these are all recipes I made up myself, but they're all very good, especially the cakes. Music: http://whereongodsgreenearth.com/index_files/ep_release.htm -> this is a new EP made by a guy I grew up with. I hope you enjoy, should you choose to use the links! thanks for the music. I likey.